2018 is promising to be a busy, engaging and exiting year for the ‘Across the Lines’ programme with two Open Calls for Participants commencing in January alongside our official Programme Launch. 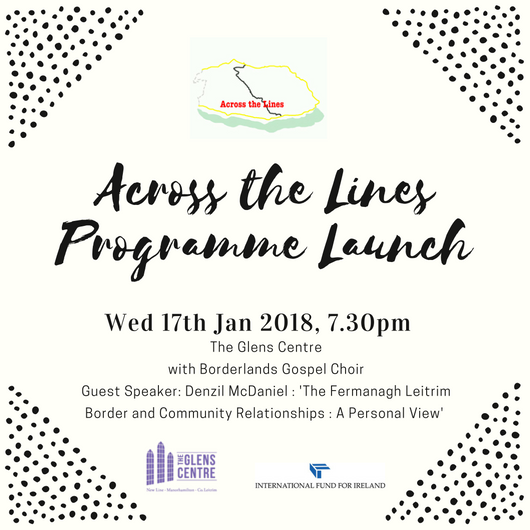 A date for the dairies is: Wed 17th Jan 7.30pm where we will be joined by the Borderlands Gospel Choir and a Guest Speaker, Denzil McDaniel all the way from …. Fermanagh! 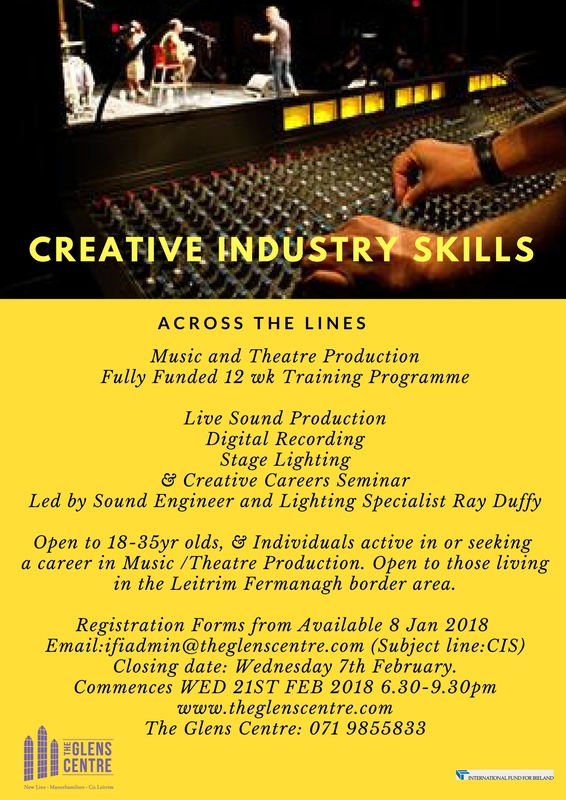 The Registration process for the Glens Centre’s new Creative Industry Skills Training will open in early January. Please contact Ray Duffy or Ruth Moore for further info. Email ifiadmin@theglenscentre.com or call into The Glens Centre for the registration form. And a new image, creativity and Development Programme for Women is also now open with opportunities for 12 women to take part. 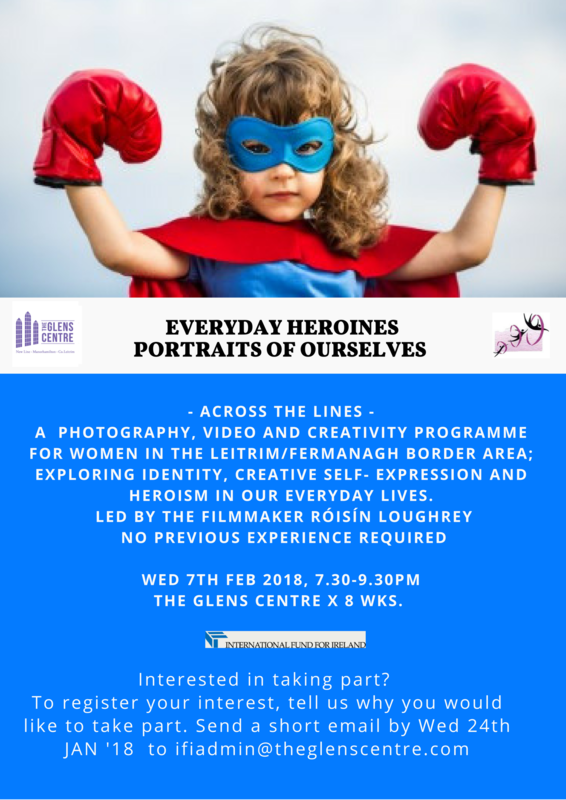 ‘Everyday Heroines : Portraits of Ourselves”. The programmes are all cross community and cross border programmes and open to people living in the North Leitrim and south west Fermanagh area. A number of other capacity building and discussion events are in the pipe line…… details are being finalised and information will be available very soon….. watch this space! Next postHear about the Beezneez Theatre Company’s production of The Drawer Boy! We will be sad to see Susan leave but she has started the ball rolling for The Glens to go on to bigger and better things with the wonderful team Susan leaves behind. Thank you, Susan and we wish you all the very best for your future and look forward to seeing you from time to time.